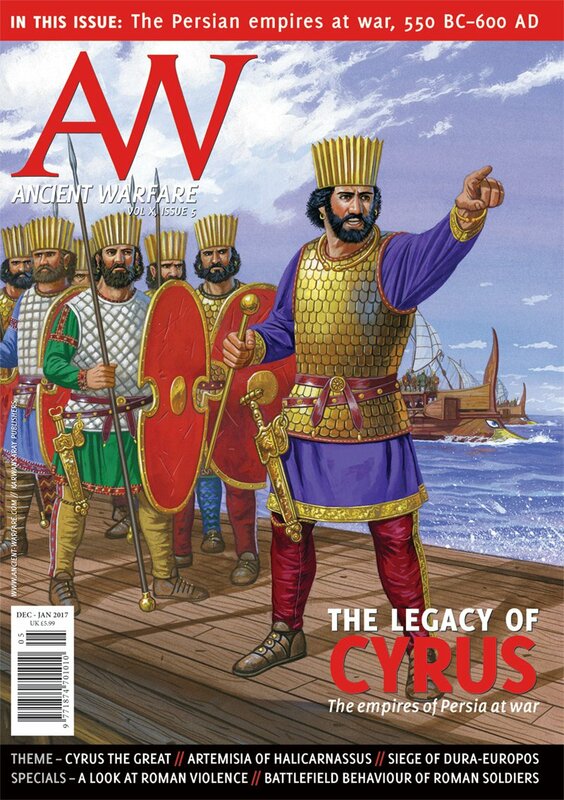 The latest Ancient Warfare just went off to the printers! This time around, we're looking at the Persian empire. 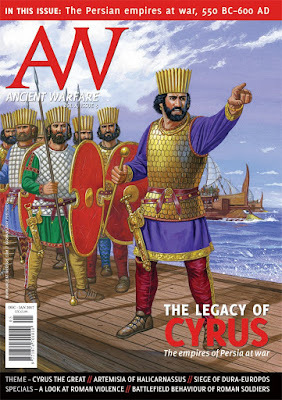 Though both earlier and later periods are covered, the main focus is on the Achaemenids and Cyrus the Great. Theme: Cristian Violatti, "The empires of Persia at war - Historical introduction"
Medes, Persians or Achaemenids? Ancient sources rarely cared to differentiate them. Their tribes united and became kingdoms, and their kingdoms turned into empires. Some of the most decisive chapters of ancient warfare were written when their ever-changing borders brought them face-to-face with the great western powers. Theme: Daan Nijssen, "Cyrus' conquest of Babylon - How history became myth"
Cyrus’ conquest of Babylon is relatively well documented thanks to the Nabonidus Chronicle, the Cyrus Cylinder, and later Greek sources like Herodotus and Xenophon. It appears that this event has left traces in later Persian oral tradition, since a story similar to Cyrus’ conquest of Babylon can be found in Ferdowsi’s Shahnameh, Iran’s national epic. Theme: Sidney E. Dean, "Cyrus and the conquest of Media - Beginning of Greatness"
Legend says that Median king Astyages dreamt that his daughter’s son would overrun his realm. To prevent this he married his daughter Mandane off to a backwater prince at the edge of his realm. But legends teach that destiny cannot be cheated. The couple had a son named Cyrus who would indeed depose his grandfather and forge an empire greater than all that had come before. Theme: Murray Dahm, ""My men have turned to women!" - Artemisia of Halicarnassus"
In his account of Xerxes’ invasion of Greece, Herodotus goes out of his way to give an account of Artemisia – female tyrant of Halicarnassus – before, during, and in the aftermath of the Battle of Salamis. This account, and Artemisia herself, are remarkable for a variety of reasons, but the idea of a capable female commander had a great impact on the ancient world. Theme: Steve Christian-Noonan, "A look at Aeschylus' The Persians - Persian Grief, Athenian triumph"
The Persians is a Greek tragic play written by Aeschylus and is also the only extant play besides the comedies whose subject matter is not taken from legend, but from recent Athenian history, i.e. the Battle of Salamis (480 BC). It provides the reader with the earliest account of the battle as witnessed by the playwright, who may also have been present at the Battle of Plataea (479 BC). Theme: Robert Holmes, "The Persian scythed chariot - A reaping whirlwind"
The Persians had a long association with the war chariot, beginning in the days of their Aryan ancestors. Yet despite this long association, the Persians never seem to have made as extensive use of the war chariot as did some of their neighbours. They did, however, develop the most recognizable and awe-inspiring war chariot of the ancient world. Theme: Arnold Blumberg, "The army of the Persian Empire, 490-330 BC"
Achaemenid Persia was the classical world’s greatest power, stretching from India to Egypt and across Asia Minor. Its nearly invincible armies comprised a mix of infantry, archers, and cavalry. The idea that hoplite warfare was superior, as marked by the Greek victory at Marathon, is called into question, as prior to that contest Persian armies won one battle after another against hoplites during the Ionian Revolt of 499–493 BC. Theme: Konstantin Nossov, "Fortress Europos (Dura-Europos) - Pompeii of the desert"
Dura-Europos – Hellenistic, then Parthian and Roman city – stood on the Euphrates, about 250km from Palmyra. Destroyed by the Sasanians in the mid-third century AD, Dura-Europos never revived and has been called the “Pompeii of the Syrian Desert” (Rostovtzeff). The dry climate and sand kept numerous rare artefacts well preserved: the siege ramp, a mine with the remains of warriors, weapons, wooden shields, and arrows for throwing machines. What will survive of this unique monument after the present war in Syria? A Sassanid archer hunting on horseback. Hunting was considered prime training for warfare, in addition to being an elite sport. This Sasanian is using a long-eared, highly reflexed composite bow. He is apparently using the ‘lock of 23’ held in a ‘straight’ position, with the hand parallel to the ground. Currently in the Los Angeles County Museum of Art. Theme: Alexander Stover, "Forbears of a formidable archery tradition"
Whether as heavily-armoured cataphracts or as footmen, the armies of the Sassanid empire used archery to devastating effect in wars against such enemies as the Romans and the Huns. The methods of the individual Persian archers of Late Antiquity provide a fascinating glimpse into a martial art and sport that was held in great prestige by their society. Long after the Sassanid Empire succumbed to the Muslim conquests, they were remembered with awe and respect. Graphic history: Josho Brouwers, "Alexander the Great on surprise attacks - Stealing victory"
As senators look on, a retiarius (right) desperately tries to defend himself from the blow of a secutor’s (left) sword. With his net lost on the secutor’s shield, and his trident tangled, the retiarius’ final hope lies in the protective qualities of his armoured shoulder-guard and padded forearm. Whilst such combat today would be seen as the embodiment of violence, evidence from the Roman world would suggest it was viewed very differently at the time. Special: Joseph Hall, "Defining (and denying) injurious force"
Until recently, academia has been in denial about the ubiquity of violence in ancient times. Even with attitudes now changing, however, the fact that violence has been ignored as a subject for so long means it is still a very under-studied field of enquiry. Few people would argue with the statement that the Roman Empire was created and maintained in large part by the use of force, so why has the study of such force – in all its contexts – received so little attention so far? The debate: Robbert Bleij, "Roman heavy infantry on the battlefield - Lines and limits"
For as long as I can remember, I have been fascinated by the behaviour of human beings under pressure – not only in my personal life, but also as a student of history. My thesis Lines and Limits deals with the psychological and physical limits and possibilities of soldiers under stress in the period of the Late Republic and the Early Principate. Hollywood Romans: David L. Reinke, ""A lively and dignified epic" - The 300 Spartans"
Given the legendary aspects of Thermopylae, it is surprising that Hollywood has largely ignored this seminal engagement. With the exception of a few documentaries, there are but two feature films to speak of: The 300 Spartans (1961) and, much more recently, Zack Snyder’s film 300 (2006). “Quite a lively epic with some dignity,” is how film critic Leslie Halliwell, with laconic brevity worthy of the Spartans, summed up The 300 Spartans.